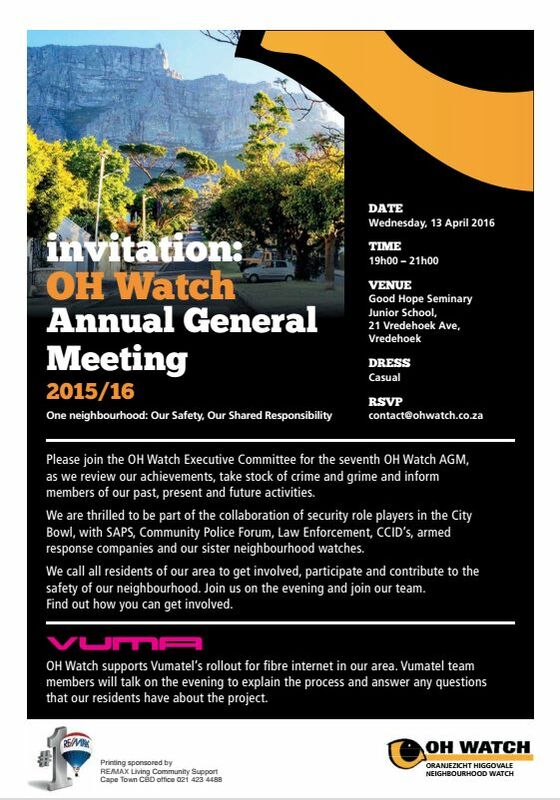 The OH Watch Executive Committee is happy to invite you to our 7th Annual General Meeting to be held on Wednesday, 13th of April 2016 at 7pm. OH Watch will be reviewing the last year and inform residents of our past, present and future activities. We will look at crime and grime in our area and how we as community can participate and collaborate to reduce criminal activities in the hood. We will also have a presentation by Vumatel where they will explain how the roll out of fibre to our homes will affect us and how it will lift the community into the future of fast internet. Please join us at 21 Vredehoek Avenue, Vredehoek at the Good Hope Seminary Junior School hall for the AGM and Vumatel presentations, after which snacks and drinks will be served. Be a part of something positive! We are putting together hampers for a raffle at our AGM. Who can assist us with sourcing prizes from our local businesses or donate prizes toward this fundraiser? Please email us on contact@ohwatch.co.za to RSVP and let us know what prizes you may have! See you there!